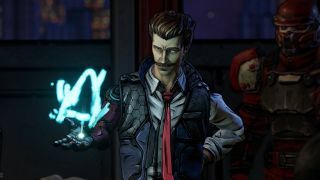 If you've seen our Borderlands 3 trailer breakdown, you'll know that several characters from Telltale's spinoff adventure game Tales from the Borderlands will be making an appearance in Gearbox's anticipated threequel, including one of its lead protagonists - Rhys, CEO of Atlas and unwilling host to the digital essence of Handsome Jack. In Tales, the character is voiced by none other than Troy Baker, famed video game voice artist known for his work in The Last of Us, Batman: Arkham Knight, Infamous: Second Son, and more. However, in spite of our assumptions, it seems that Baker won't be playing Rhys in Borderlands 3, as the actor confirmed the news at a convention Q&A in Melbourne, Australia over the weekend. "I'm sorry to break it to y'all, [but] that isn't me", said Baker, in response to a fan's question about his potential involvement as Rhys in Borderlands 3, explaining that there were early conversations with Gearbox about returning to the role before the actor discovered that the studio apparently went with someone else when he saw Rhys make an appearance in the trailer. Baker admitted he didn't want to get "political" calling out Gearbox in this way, but the man is clearly disappointed not to have been asked back to the world of Pandora. That said, it's not like he's short for work right now, as Baker is scheduled to appear in Death Stranding, The Last of Us 2, and goodness knows what else that might be announced as part of the E3 2019 games lineup. Still, Borderlands 3's Rhys won't quite be the same without the dulcet tones of the actor who defined him, even while the rest of the game looks nothing short of spectacular. Find out how there's still a chance of a Borderlands 3 Handsome Jack appearance in Gearbox's upcoming looter shooter, or watch the video below to find out all the secrets you missed in the Borderlands 3 trailer.